We recently stayed at http://www.aylestonecourt.com/ on a short trip away (highly recommended!) and ate in the hotel restaurant on the first night. We both chose this dish & enjoyed it so much that this is my attempt to recreate it at home. On a low heat, melt the butter. Gently cook the onion & garlic until translucent. Add the mushrooms & cook for a minute or two more. Meanwhile, cook the pasta according to the packet instructions (it should only take 3 mins). Once the mushrooms have released their juice, turn the heat up & add a generous splash of white wine. Allow this to cook off. Turn the heat down & add the cream & blue cheese. 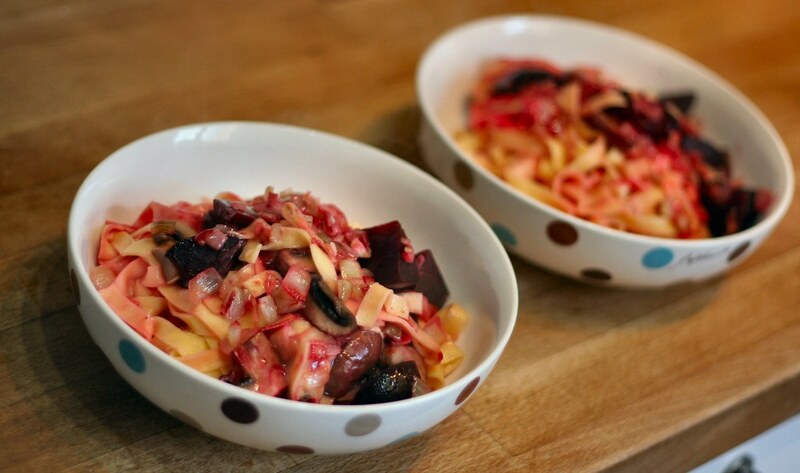 Add the cooked & drained pasta to the sauce, along with the beetroot.